Cycled in from Linn of Dee to White Bridge and then on northwards past the Chest of Dee as far as sensible. Autumn colours at the Chest were gorgeous. After abandoning the bikes it was a long slog up onto Beinn Bhrotain. Plenty of stags roaring and a few ptarmigan higher up, but not much other wildlife. 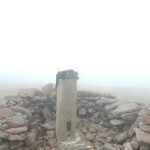 Cloud came in a bit on the summit and the wind definitely had an autumnal feel to it. Found a better line on the descent, sticking to the high ground to avoid the bogs. Then a quick whizz back on the bikes. It was going to be too late for the Bothy so a promise of chips was made instead, but sadly the Hungry Highlander let us down. Co-op saved the day with chocolate cake to get us back to Ballater. That’s me reached enough cps to claim my mug. This entry was posted in cp11, cp4 and tagged EwanM, JonM, SarahD on October 15, 2015 by site_admin. 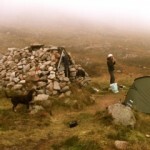 A great sleep in Corrour Bothy – and after a good breakfast, headed south to Allt Garbh, and found track up towards Beinn Bhrotain. Followed the Allt Garbh to Coire an t-Sneachtda, three quarters of the way up to Beinn Bhrotain, and then into some cloud, so only about 100m visibility on the top. Super walk up, some of it on the granite slabs in the burn. Also a great descent, easy running back down to collect the bags, some lunch and a wee rest in the sunshine…. 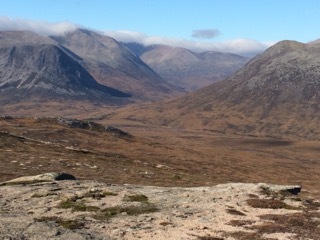 Then up through the heather to Sgor Mor, in the sunshine. Interesting granite slabs on top. 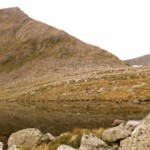 Could have routed across the tops back direct to Linn of Dee – but my bike was at Derry Lodge…. 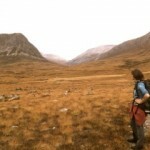 Descent down Allt a Choire Dhuibh to Gleann Laoigh Beag – slow going with the baggage. Very glad to reach the track and then Derry Lodge. This entry was posted in cp10, cp4 and tagged Warren on October 12, 2015 by site_admin. 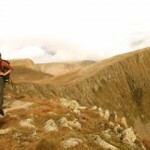 Big day (Sunday 16th August) with a whole lot of climb. 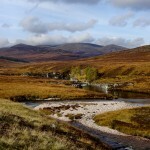 Bike to White Bridge from Linn of Dee. Little sun but very windy and very clear. Top day and very few folk about for a weekend. Done in by the end pretty much. This entry was posted in cp11, cp4, cp5, cp8 and tagged RogerC on August 28, 2015 by site_admin. Opted for return to White bridge and then continued to cycle, to Chest of Dee (CP 11 for 3rd time, and I was concerned when I passed so close to it on an early ticking adventure, but not close enough! ), again continued up track till I gave up on bike. 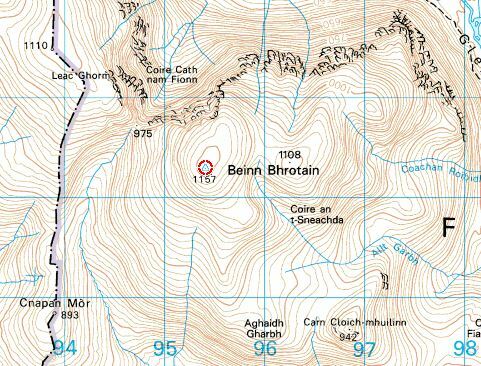 Ran a bit but headed off up the hills towards Carn Chloich-mhuilinn, avoiding summit to check out a crag I can find no reference too in the guide or on the map. 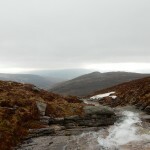 From there the inspate Allt Garbh was followed up and into the mist. A track was found and lost and the rain came, and the the mist thickened. 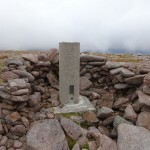 A cairn was reached then a bit of height lost then re-gained, and then snow. 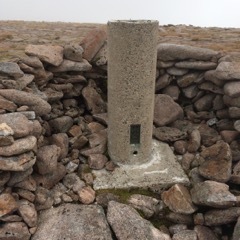 Kept heading up due west and after a while the snow ended and the slope eased off and then out of the mist came the Trig Point. (thank god for mappers). After the obligatory pic took a bearing and followed it into the mist. Snow was quickly reached which made for easy descent…until it started to steepen and harden and visibility down to say 5m…ah well press on and hope and sure enough the angle eased, the snow ened and as the visability returned so did the Allt Garbh path. This entry was posted in cp4 and tagged Duncan on June 16, 2015 by site_admin.